The San Jose Blog: Update: The Downtown San Jose Whole Foods Opens on December 9th! Update: The Downtown San Jose Whole Foods Opens on December 9th! 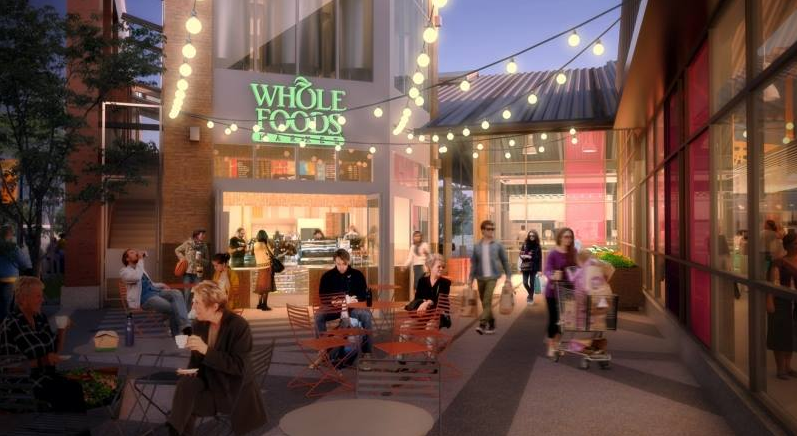 The highly anticipated Whole Foods on The Alameda finally has a grand opening date! Mark your calendars for December 10th December 9th. Update: the grand opening has been pushed forward by a day! That is when both the grocery store and the two-story microbrewery/tap room open up. This will be the very first Whole Foods with an integrated microbrewery. The store is grocery going to be 35,000 SQFT while the brewery building will clock in at 5,600 SQFT. There is a patio area connecting the two buildings which you can see in the photo below. The brewery will also have a coffee and fresh juice venue and a restaurant-style menu. 15 taps will be curated by an in-house brewmaster, which will host a wide variety of seasonal and local beers in addition to the signature brews made in house. Whole Foods is also pursuing LEED certifications for the store given its many environmental initiatives. High recycled content bricks, reclaimed red cedar, and an onsite heat and power plant were all part of construction. 38 new trees were also planted on the street and parking lot, there are 4 electric vehicle charging stations, and low water plantings were used in order to reduce water usage. This could really be a catalyst for The Alameda and West Downtown by the SAP Center. This opening gives residents within a few miles easy access to a high-end grocery store. This has been many years in the making--finally a Downtown Whole Foods is coming to fruition! Thanks to Alex Shoor and Andy Wasklewicz for sending this in! Emeryville, Calif. (Sept. 10, 2014) – A new 35,000 square-foot Whole Foods Market store will open on December 9th at 777 The Alameda (at Stockton) in San Jose, California. This is the second Whole Foods Market location in San Jose, and the 42nd in Northern California. The store will bring an estimated 150 new jobs to San Jose. This new store will be home to the first in-store microbrewery and tap room for Whole Foods Market in California. The two-story, 5,600 square-foot brewery building will also house a coffee and fresh juice venue, as well as offering plenty of seating and a restaurant-style menu. An in-house brewmaster will create signature beers for the tap room, and a total of 15 taps will offer a wide variety of seasonal and local brews, as well as some nationally-available favorites. Whole Foods Market San Jose is also innovating with this store via environmental initiatives. The company is pursuing LEED certification for the store, and this project is one of the company’s most environmentally efficient. Locally manufactured, reclaimed, recycled and low- to non-emitting materials are being used in construction including reclaimed Western Red Cedar siding, high recycled content tile from Fireclay (based locally), Forest Stewardship Council certified decking, and high recycled content bricks made in Sacramento. An onsite Combined Heat and Power plant will provide continuous electric and thermal power, reducing the store’s dependence on the public grid by around 90 percent. This is also one of only a few grocery stores in the nation that will use nearly 100% natural refrigerants by relying on a state-of-the-art CO2 refrigeration system. Jeff Giardinelli, who formerly ran Whole Foods Market’s Fresno store, has been hired as Store Team Leader. Michelle Hohmeier oversees local partnerships, sponsorships and charitable giving as the store’s Marketing and Community Relations Team Leader. As it brings redevelopment to the abandoned site within the Diridon Station Area Plan, the store will help create a dense, more walkable neighborhood. Five Percent Days, Nickels for Nonprofits, and food and fund drives will add to the store’s community support initiatives. Customers will find many local products on the shelves, too, as part of Whole Foods Market’s commitment to supporting local makers and growers. More information on the brewery, local vendors, community partnerships and store features is forthcoming. For updates, customers can follow the store at facebook.com/WFMSanJose.